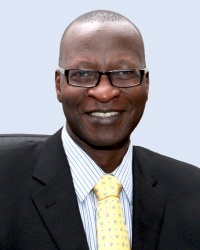 Sowedi Muyingo is Executive Director of Medical Access Uganda Limited (MAUL). In 1998, Sowedi spearheaded the creation and establishment of MAUL under the UNAIDS Drug Access Initiative1 and has since led the transition of the organization from a fully-funded project to a self-sustaining, innovative one-stop-shop for healthcare supply chain management. With more than 20 years of experience in global health management across both the public and private sectors, he is responsible for leading the organization’s strategic vision in partnership with the Board of Directors and currently oversees all operational departments, including procurement, warehousing, distribution, sales and marketing, project management, consulting and technical assistance. Prior to MAUL, Sowedi served as Vice President at Axios International, a global healthcare consulting firm, where he led the design and implementation of several access programs for HIV/AIDS and cancer across Africa and other developing countries. In this role, he setup PEPFAR-funded Supply Chain Management system in Zambia, Tanzania and Nigeria and coordinated the implementation of the NIH-funded cost effectiveness study, PANCEA, in Uganda and South Africa. Sowedi also previously worked as a Logistics and Financial management Specialist with the USAID-DISH II project, coordinating district-level strategic planning, budgeting, financial/grant management, training and monitoring for 12 USAID-DISH supported districts, and as a Drug Registration and Assessment Pharmacist at the Uganda National Drug Regulatory Authority. Sowedi began his career in the private sector as a Pharmacist Director and Medical Representative with Mepha LTF and Novartis, where he managed procurement, marketing and distribution of a range of pharmaceuticals from distributors across the globe. He holds a Bachelor in Pharmacy and a Master of Business Administration from Makerere University (Kampala, Uganda), as well as a Master of Public Health from John Hopkins University (United States). Sowedi has also completed courses in International Project Management from INSEAD (France) and Health Systems Research and Epidemiology from the Harvard School of Public Health, and is an Associate member of the Chartered Institute of Purchasing and Supply (CIPS). Originally from Uganda, he is fluent in English, Luganda and conversant in Swahili.